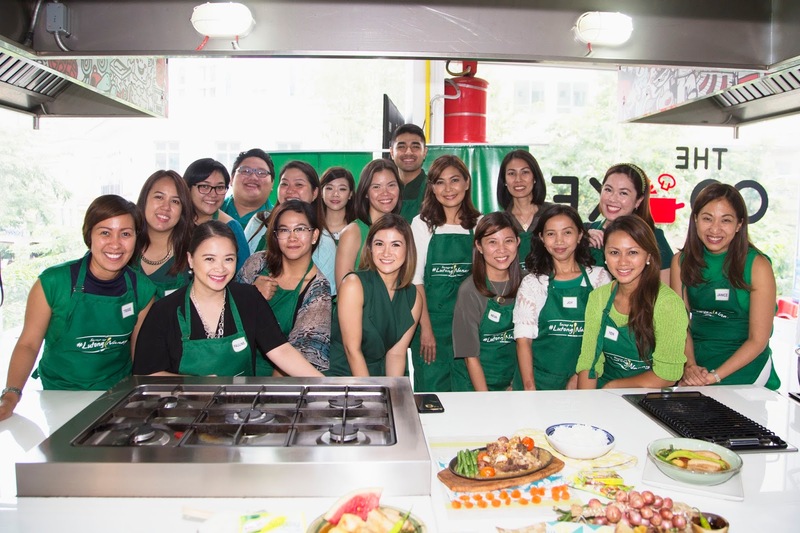 Knorr #LutongNanay Helps Busy Moms Bring Back Home-cooked Meals! I’ve been a working mom ever since and I can totally relate to these famous phrases “Naku, wala na kasing time..” or “Sobra kasing busy at ang daming gagawin…” when asked if a mom still cooks for the family. Oftentimes pa, we’re judged for not putting the family’s welfare our priority, especially when it comes to health and nutrition of the kids. Pwede bang wala kasi talagang time or super pagod na pagdating sa house? In this era when instant food and fast food restaurants abound, it’s easy to rely on them right? But personally, I cook breakfast every day for the family and special viands during weekends. 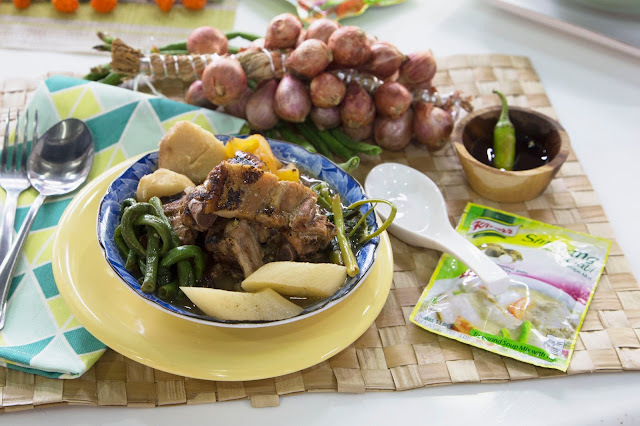 When I say special viands, these include their all-time favorite, Sinigang. 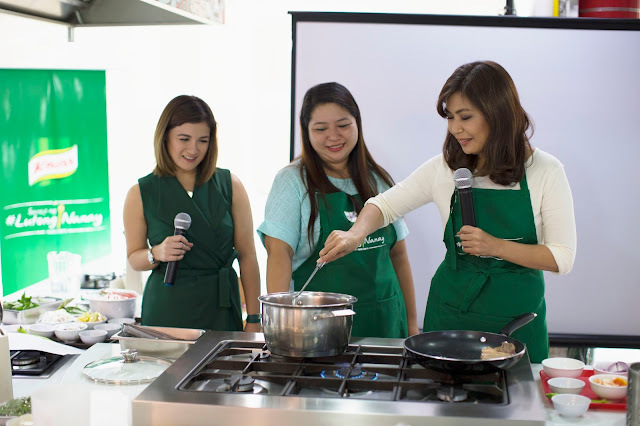 I discovered recently that there are many ways to cook their favorite Sinigang in Knorr’s #LutongNanay event held at The Cookery Place, BGC last July 4, 2016. 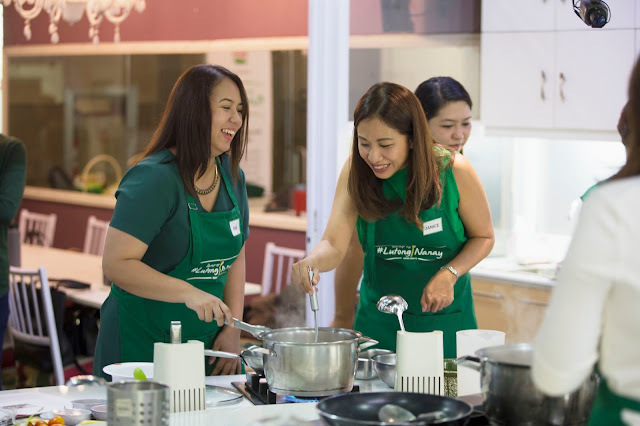 Knorr’s #LutongNanay is already on its 3rd year and continues to champion delicious, home cooked meals for the Filipino family. 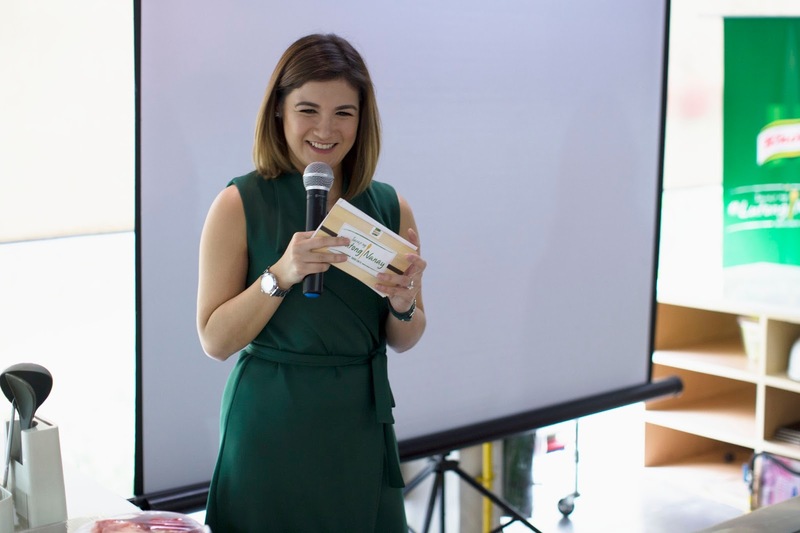 The event was hosted by a young celebrity and a doting mom herself, Ms. Camille Pratts. 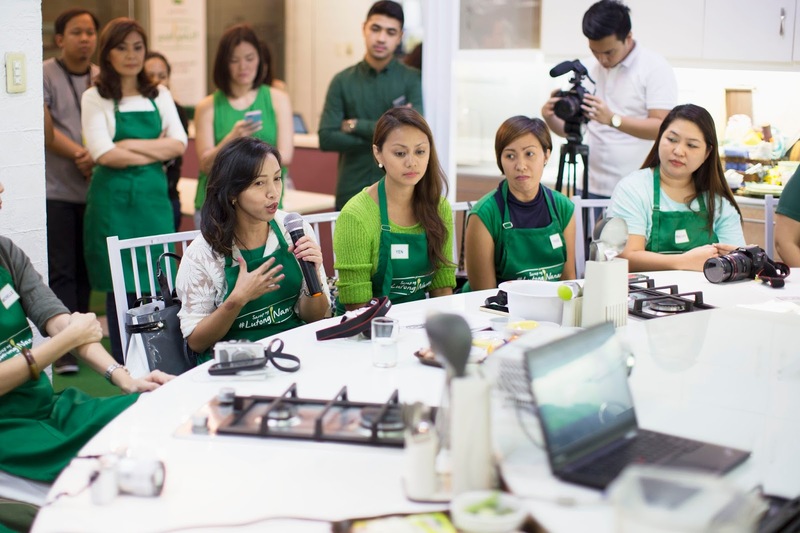 The event started with a group sharing from the participants and a short presentation by Knorr with focus on Sinigang. The event started with a group sharing from the participants. But first, what is Knorr’s #LutongNanay campaign? 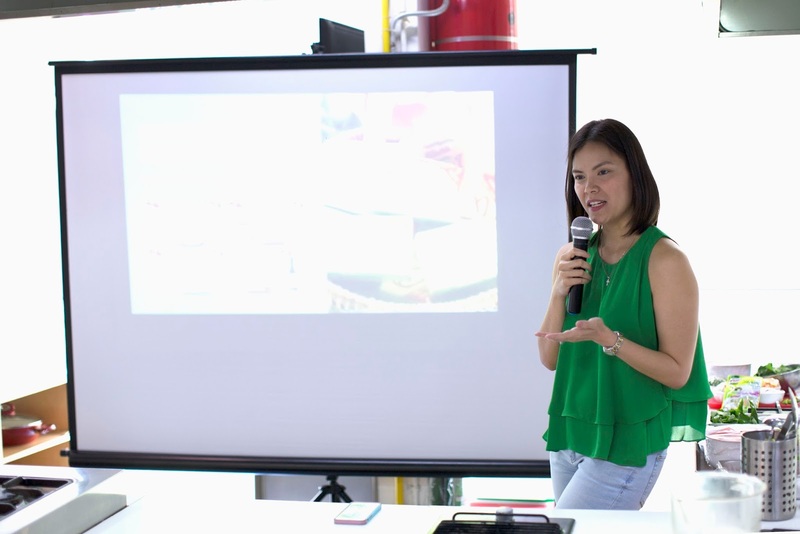 Knorr’s Senior Brand Manager, Czarina de Leon-Manalo shares what Knorr's #LutongNanay Campaign is all about. According to Knorr’s Senior Brand Manager, Czarina de Leon-Manalo, “Our goal is to bring back the value behind home cooked meals especially since people choose to eat outside or even alone in this fast-paced world. Knorr aims to help more moms bring the family together through the best flavors in their cooking.” I believe that this campaign is best for busy and working moms like me, who are often intimidated by kitchen appliances or complicated ingredients just to cook one meal. The campaign is helpful in introducing simple, smart, and great tasting dishes that the family will truly love through recipe sharing. “Cooking is a force for good. When a mother cooks, it is often seen as a way for her to ensure her family’s well being – and through Knorr, moms can serve nutritious meals without sacrificing great flavor” Manalo continues. Sinigang cooking demonstration by Sari Jorge, a renowned chef and businesswoman. Another group of mommies trying out another Sinigang variation. 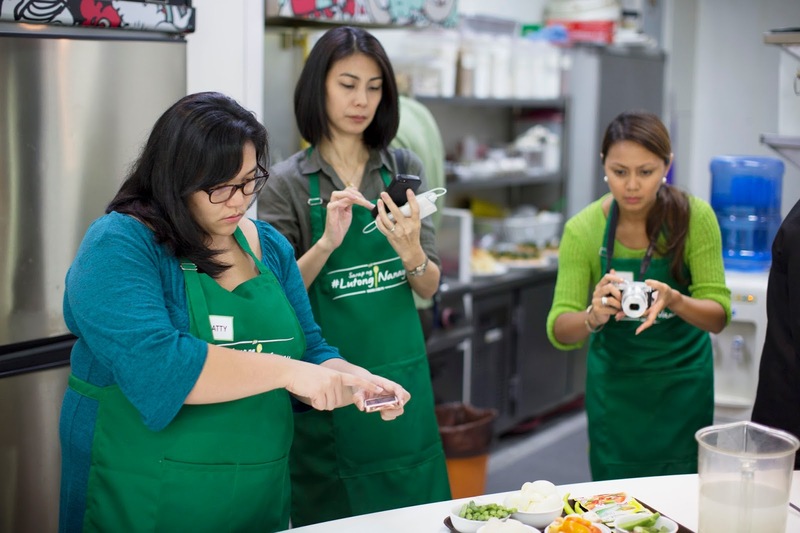 Patricia, Michelle, and Yen seriously capturing their finished Sinigang version. Though I wasn’t personally there at the event (I was busy giving birth to my third child! 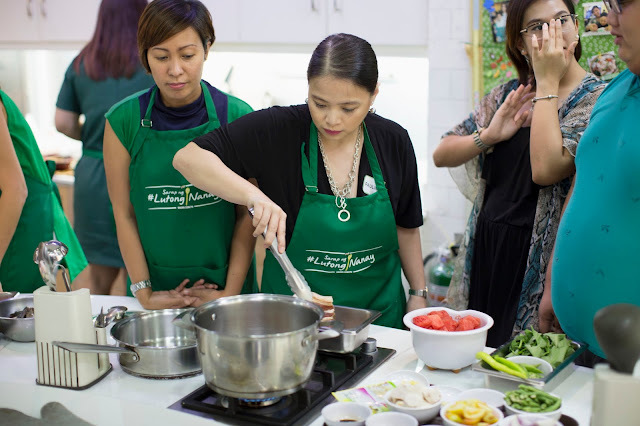 ), I was updated through social media by my friends who share the same passion for food and flavor, that they enjoyed their time cooking the different Sinigang recipes themselves. Knorr focused on Sinigang that afternoon because again it’s an all-time family soup-based healthy meal. Four different Sinigang variations were prepared and enjoyed that day, namely: Knorr Sinigang with Pakwan (definitely something new to me), Knorr Surf and Turf Sinigang, Knorr Sinigang na Grilled Liempo and Knorr Sizzling Sinigang. All these were demonstrated by the renowned chef and businesswoman, Sari Jorge. 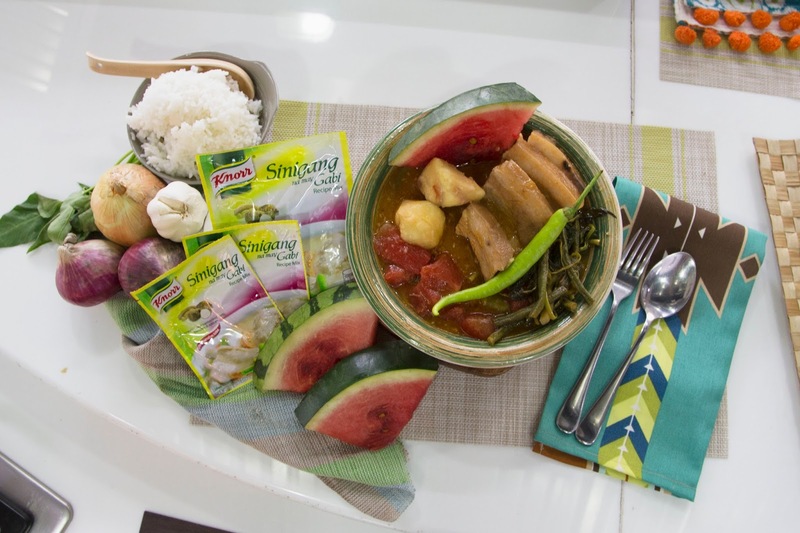 The participants were grouped into four to create these out-of-the-ordinary Sinigang versions themselves. 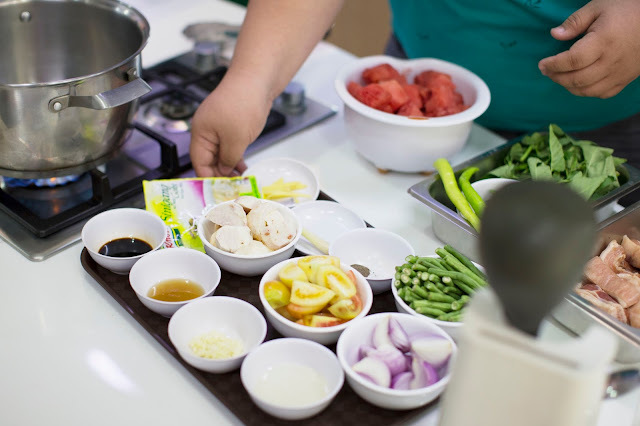 The cooking part alone looked fun, but for me, the best part of it all, was when each group got to taste the other group’s assigned Sinigang recipe! I’m sure everyone came home with a full and happy tummy and created another great memory. Now, let me share with you the recipe of one of the four versions of Sinigang, Knorr Sinigang sa Pakwan. Marinate the pork belly in Knorr Liquid Seasoning for at least 30 mins. Place a large casserole over medium-high heat. Add the oil and, working in batches, cook the pork until evenly browned. Remove with a slotted spoon and set aside. Reduce the heat to medium. Add the garlic and onions to the casserole. Add the tomatoes, ginger, lemongrass, gabi and watermelon and cook for 2 minutes before returning the pork to the casserole. Add the water, Knorr Sinigang sa Gabi Mix, Knorr Beef Cube. Cook for a further 1–1½ hours until the pork is tender. When the pork is tender, remove the pork from the casserole and set aside. Strain the liquid and add the fish sauce, soy sauce and pepper to taste. Add the remaining watermelon, beans, chilies, and okra and cook for 20 minutes, before adding the water spinach and cooking for a minute until all the vegetables are tender. Serve with steamed white rice and fish sauce for dipping. Tadah! 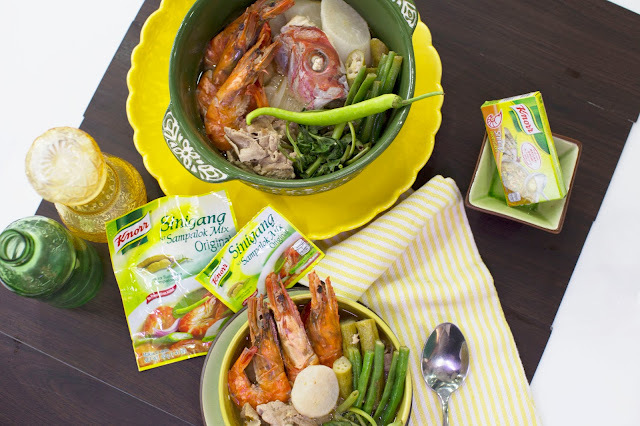 Another learned Sinigang recipe which I’m sure your family will also love! Now, there’s no reason for a busy and working mom to say they have no time to cook for their family even on weekends. With Knorr’s #LutongNanay campaign, preparing meals and personally looking after the well-being of the family will be easier to achieve. 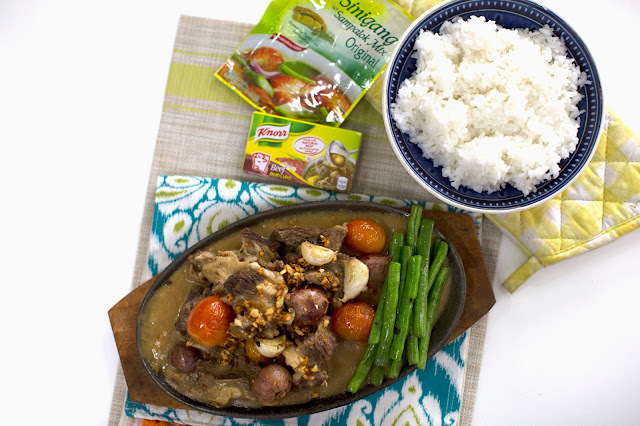 like Knorr Philippines on Facebook.